There is no one that's as hard working in the wizarding world as the House Elves. Yes, Hermione doesn't approve of fancy wizard households letting them do all the housework for generations on end. We get it, all creatures should have their freedoms. But really, chores are what house elves do! They're like silent roommates that not only pick up after themselves and you but they'll also repaint the house, rewire the lighting, and trim the bushes. That's umm... someone you'll want around. Now, we muggles might have robots that clean our floors but we haven't quite learned to lure house elves into our homes. Not that we'd want any creature to feel compelled to clean our houses without fair compensation, Hermione! 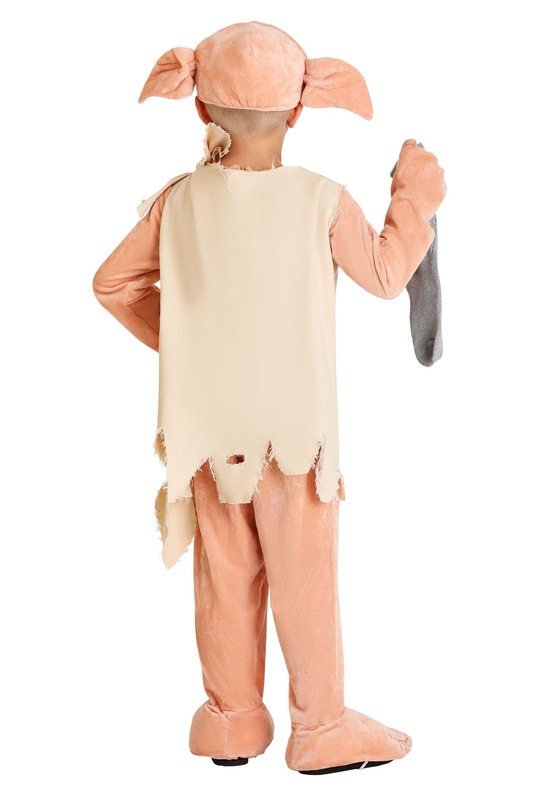 Encourage your little one to embrace a chore-rich lifestyle with this simply adorable Dobby outfit. 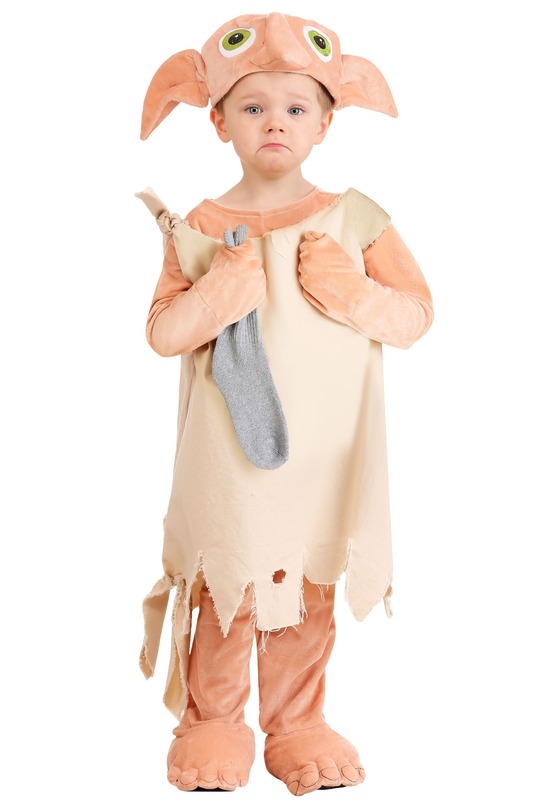 Cause if your little one is going to be a house elf, they're going to be one with a sense of freedom! This licensed Harry Potter Dobby costume will make your little one the most lovable house elf the Wizarding World has ever met! After all, this is the little guy who tried to save Harry Potter's life when no one else did. 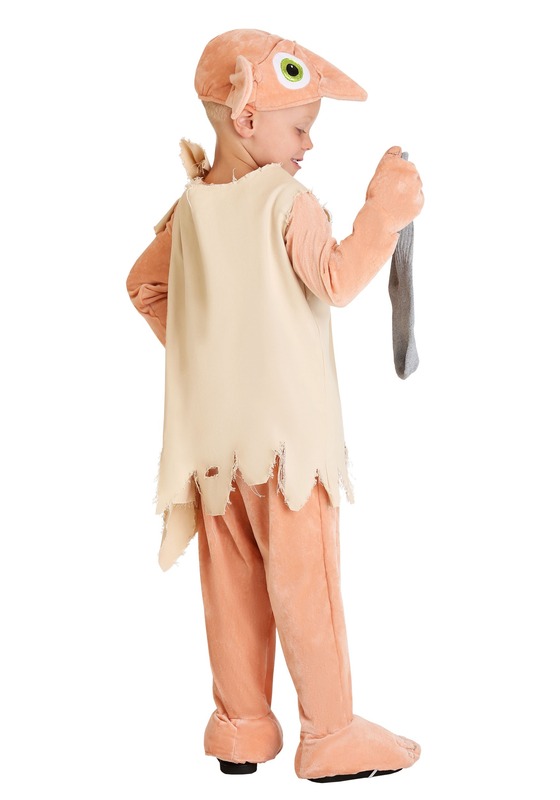 This costume's jumpsuit has a super soft texture. The legs are attached to foot covers and hand covers. The fabric is a soft, pink, velvety texture. The hat has large ears, a plush nose, and large green eyes. The soft jumpsuit is hung with a rag cause and it comes with a sock cause Dobby simply isn't free elf without his ensemble. Are you putting together the Harry Potter crew? We simply can't understand how Hogwarts would be the same without this smart little fellow. Pair up Dobby with his ally, Hermione, as well as the rest of the Gryffindor crew and the professors. There's no limit to how many people can pair together to make the Wizarding World come to life! 6/12 Months Tunic 31" 31"
12/18 Months Tunic 33" 33"
18 Months/2T Tunic 35" 35"